Last day of the month - time flies as you get older. There isn't much happening on the farm now. I have a few more beds of broad beans to go in but that is about all. We got a little rain over the past couple of days so that should bring the clover and weeds up so I will put off planting the beans a week or two so I can clean the bed of seedling weeds before planting. It will make weeding easier later. A local lady who is opening a gift store in town soon has asked me to make up some terrariums and terrarium kits for her shop so that has been an interesting distraction over the past couple of days. I popped over to the Mount and bought some bottles and plants - I already have everything else I need here. 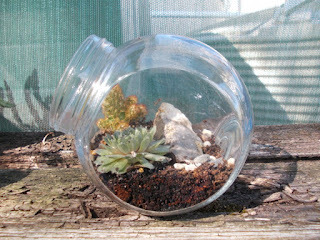 I am wondering if there is a market for terrarium kits as an add on to my online store. Hmmm. 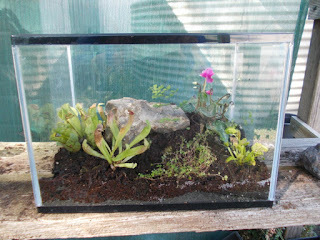 I also saw that Bunnings had some carnivorous plants so I splurged out on them too. Some are starting to go dormant but that is to be expected at this time. They will perk up in spring. These are a few of the dozen pitcher plants I bought as well as a couple of terrariums that I have been playing with. 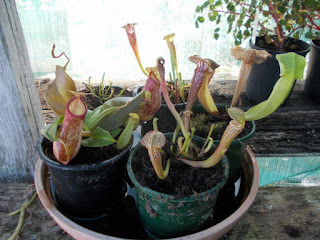 I am not sure if I will be able to keep the Nepenthes alive over the winter but I will find out I suppose. After having a stall at the Port Fairy market yesterday I was too tired to go out to the farm when I got back in the afternoon. I did pretty well and I think I will continue to go there once a month. I also have the big Easter market there next month too - so two markets next month. It is a pleasant little market and everyone is very nice. 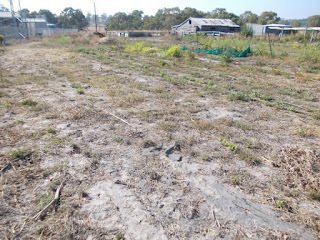 This morning when I got out to the farm I saw that the cockies have attacked most of the ripening eggplants and left chewed fruits everywhere. They also tore into my cotton plants which I was surprised at. They picked off and chewed every pod as well as nipping all the plants off. I might have to stop growing most veg altogether if this happens again next year. At least my summer water bill was less than I expected so I haven't lost too much money. I put some spare netting over as many plants as possible just so I will be able to save some seed, even enough to replant next year. At least they aren't doing too much damage to the sprouting potatoes, just a few nipped off here and there. Looks like potatoes are the go. Other than that there hasn't been anything happening. Most of the garlic is in now and I still have to plant the broad beans. I have been waiting for the temps to fall before planting the beans and I think that now the hot weather is finally over. I will get them in this coming week. With practically everything harvested from the summer crops and still some hot weather to go there is not much for me to do at the moment. I really should have planted any brassicas by now but it is still hot and so dry that I am waiting for the weather to break first. Hopefully that will be next week. I have started cleaning and mowing the harvested beds ready for the brassicas, garlic and broad beans. 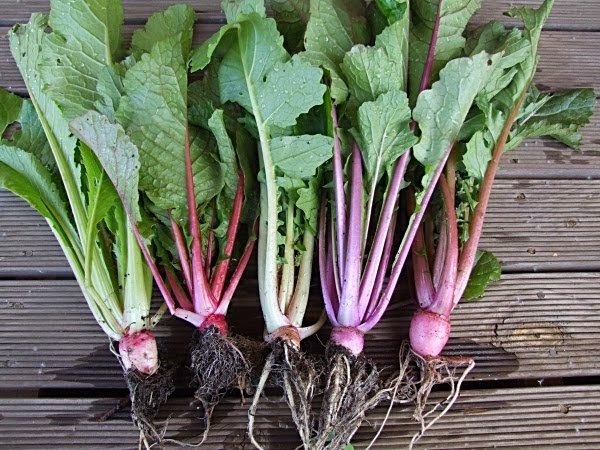 Usually I don't plant many brassicas because the winter is too wet for them but I will give some a go this year because I have some spare seed that I can afford to lose. I have decided to let go the town blocks that I was using as I am too busy on the farm to look after them properly. It will cut down on some of the varieties I will be able to grow but I can cope with that, especially as I am moving into more plants that I don't have to worry about crossing. I have kept the block at the back of our house though as I still need a quarantine block in case I get new seeds or bulbs from iffy sources. 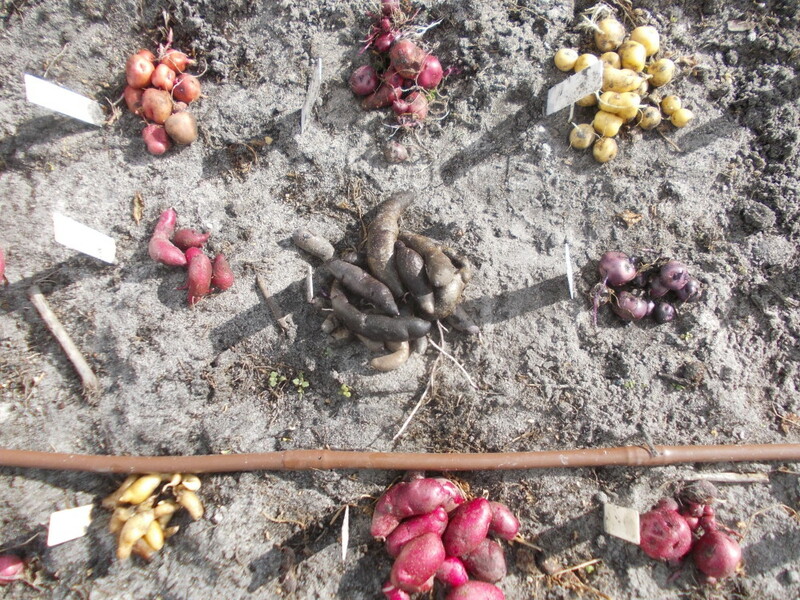 All the potatoes are harvested now and some with low dormancy have been replanted for their second, or in one case third, crop for the season. 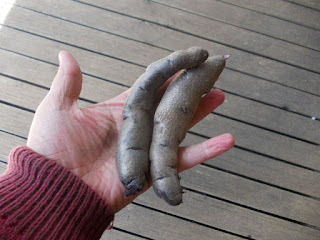 I made a video of harvesting the last of the mini TPS (True Potato Seed) tubers. it is not very good but I now have a tripod and am going to learn how to edit properly. Future videos should be better quality with practice. Over the past few days I have been busy saving seeds from the tomatoes I have left, harvesting my peanuts, and doing all sorts of small jobs before the cooler weather starts bringing out the weeds and I get busy with them. I have started planting my winter veg - garlic, broad beans and brassicas (well I planted some brassicas a couple of weeks ago but birds pulled them up so I have them netted now). I will probably put in some lettuces too, maybe celtuce as I love it. A couple of months ago I decided to try my hand at propagating leaves from my mothers African violets. The leaves are now making babies, how exciting!! The down side is that I haven't thought beyond this point to where I am going to put them when they are potted up. We only have one place in the house that is suited to growing them and it is already full of violets. 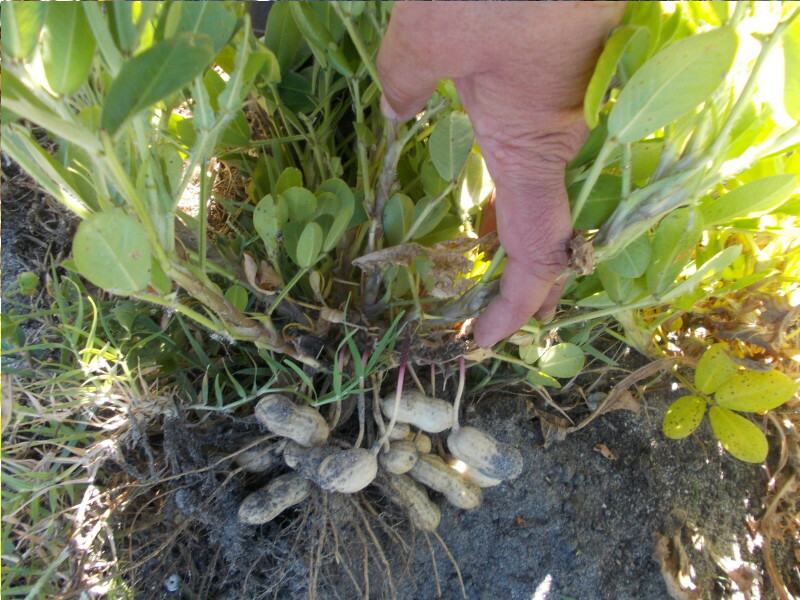 I got into my peanuts as they were starting to yellow and pulled them all up. Last year I pulled them a bit late and some of the seeds were starting to reshoot but they are fine this year. 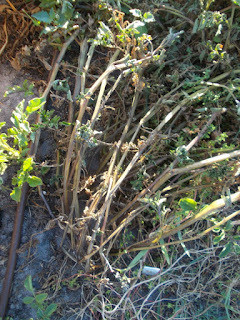 Because of the cold, long spring the plants didn't grow properly and the plants have only a dozen or so pods each. 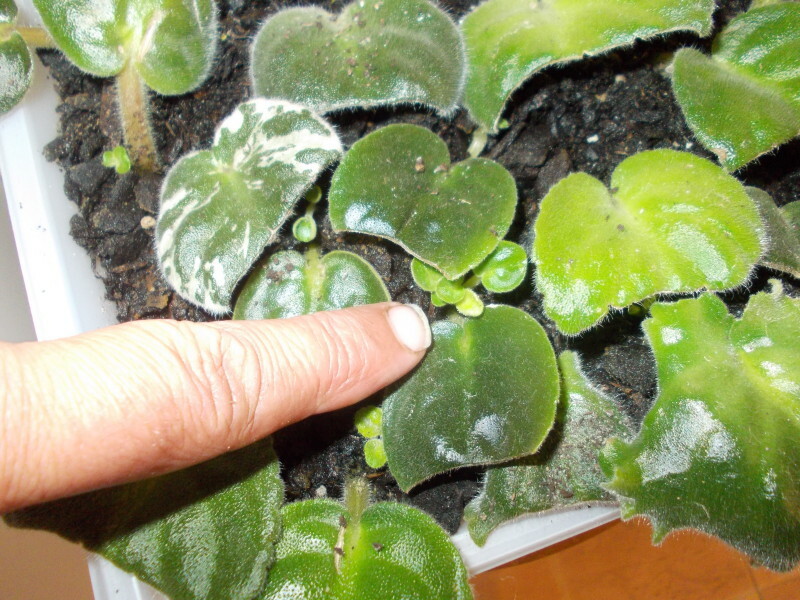 I suppose I can't ask more of such small plants. I must plant them later next year to stop this happening again. My worry right now is that the cockatoos might see them and decide that they are a good feed, but I have to lay them out to dry before taking the pods off so I have to risk that. I am only going to leave them lay for a couple of days because of this threat but that should still be fine as long as i dry the pods well so they don't rot in storage. A few years ago I grew some pomegranates from a supermarket fruit. 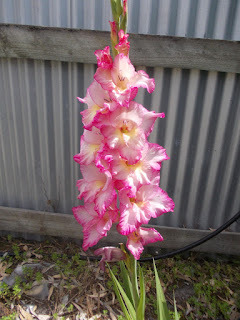 They flowered for the first time last year but didn't set any fruit. 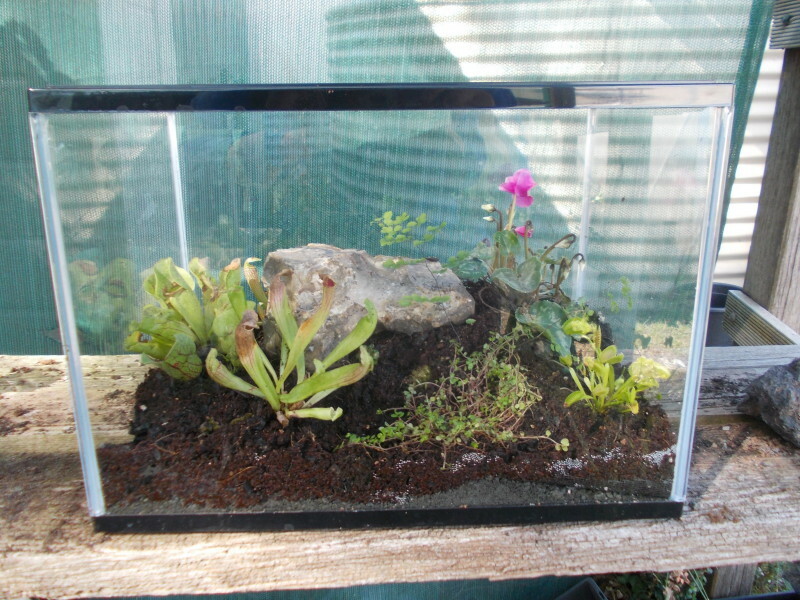 I didn't expect them to as they were still small plants. Now I just have to wait to see if the parrots find them attractive. At least these trees are still small enough to net. 1, It takes months of growing and a lot of expensive water to produce one harvest, whereas with neutral day plants that don't have a long dormancy I can get two harvests in the same time. 2, With such a long growing period over the hottest part of summer there is more risk of losing the whole crop to heat wave which would waste all the water spent on them. 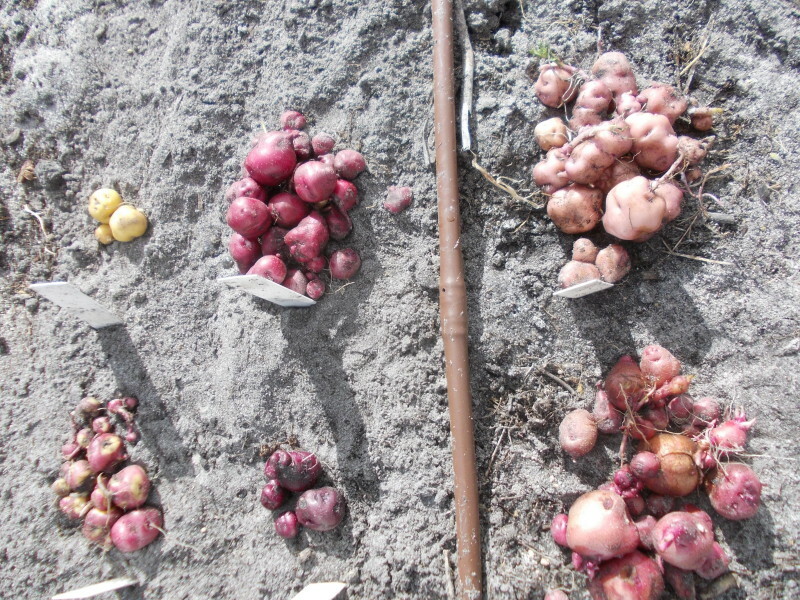 The good thing about short day tuberisers is that they usually have a long dormancy and are easier to get over the winter in good condition. 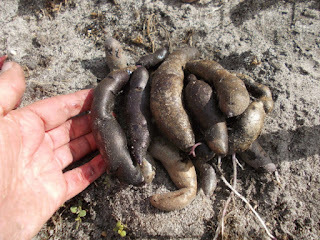 Anyway, at the end of this post I will show a few of the tubers from these later plants. 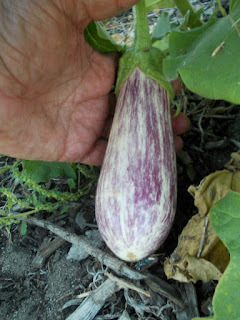 Finally I have harvested this seedling that we have been following since planting in October. 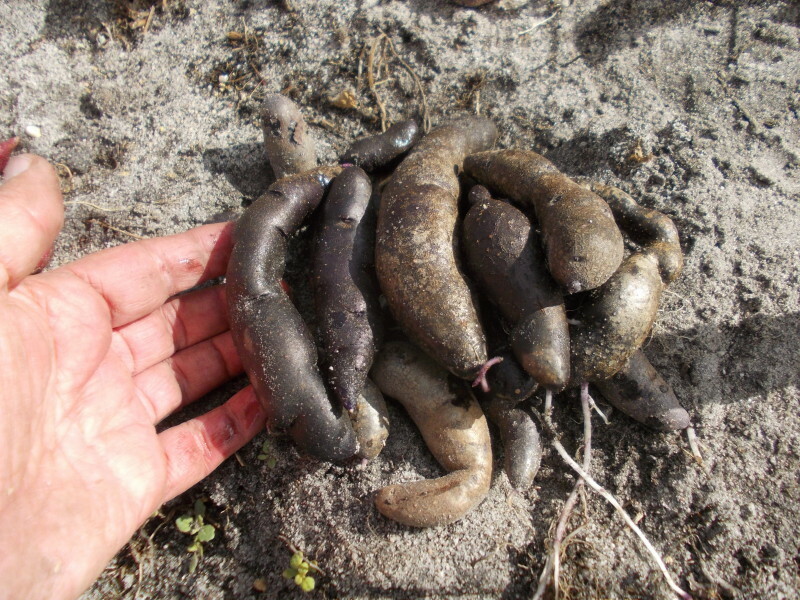 It produced these long, thin, very dark, almost black coloured tubers. I took a couple home to cook and was surprised to see that the flesh turned blue when boiled. 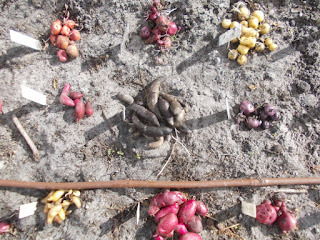 The tubers had already started to resprout which would normally cause me to discard it but the combination of cooking colour and the fact that I want to show the entire cycle of growing means that I have replanted them to try and get a full sized crop before frost kills the plants off. This means that there are more episodes of this story to go. I always replant late tuberisers for a second season before evaluating them as the first season they only produce mini tubers. Another potato I have been growing for a couple of years is the diploid that I have named Sassy lass. 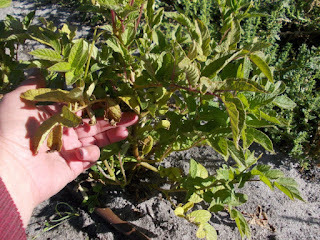 This variety has no dormancy and I would normally have rejected it except that my mother really likes the flavour of it and because since it has no dormancy and grows so fast I have continually grow and harvest it all season. 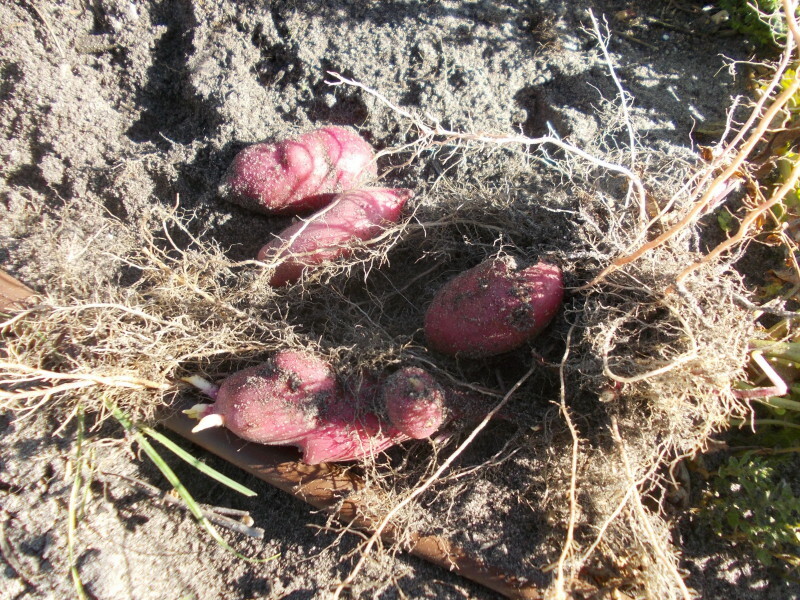 When the frosts come and it goes dormant I just leave the tubers in pots and before they restart sprouting in spring I plant about a third and leave the rest in a fridge. After the first lot start sprouting I plant the next third and a couple of weeks after that I plant the rest. This means there is always some to harvest. 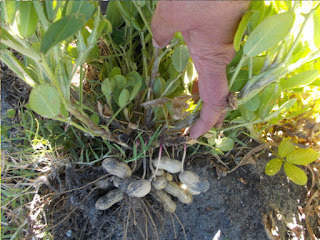 They can be harvested only 8 weeks or so after planting. Even small plants produce well. This year they are not producing as well as last year but I think it is because I have planted them in the poorest soil I have this season. 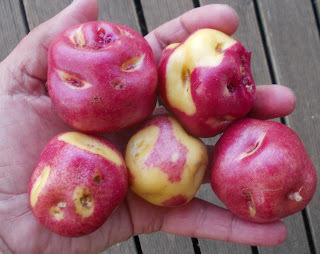 Here are some pics of a few of the diploid and tetraploid mini tubers I harvested yesterday. I got a great mix of colours and I particularly like the bi-colours. 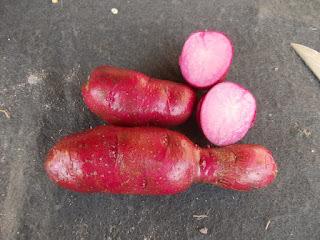 I cot one particularly good pink and gold bi-colour with neon yellow flesh that has a sticky, filling texture and great flavour. I hope it makes it through the winter and produces well next season. I have replanted all of these mini tubers. Some with low dormancy will sprout soon and hopfully produce a harvest before frost, and many will stay dormant in the soil till spring. I have found that it is easier to keep mini tubers in the soil than try to overwinter them inside. 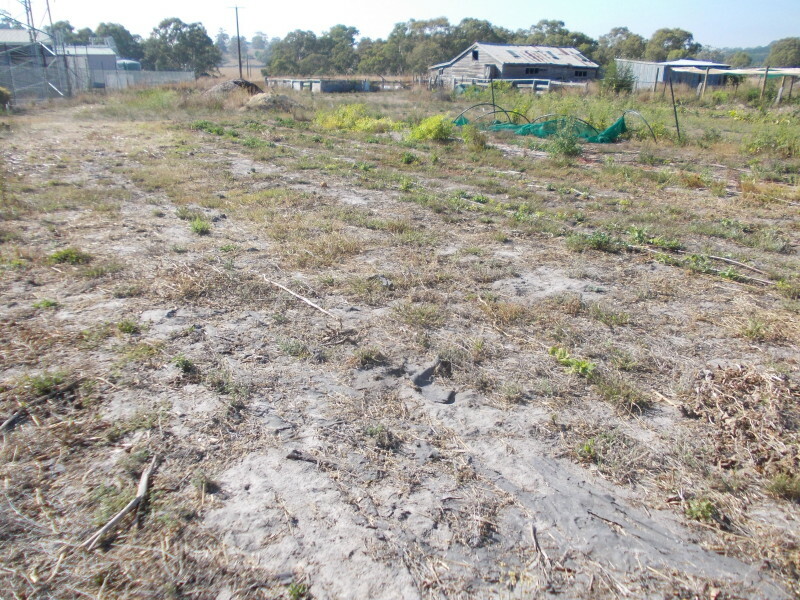 In Australia our soil doesn't freeze but my only worry is waterlogged soil rotting them. I have planted them in the driest spot so hopefully they will be ok. The end of the hottest weather? perhaps. Whew, only 31 degrees C today. it looks like this current heatwave of about 10 days of around 40 degrees might be over. I hate hot weather and I really hope that this is the end of the really hot days. The heat has cooked the stems of just about all the seedling potato plants that have survived so far. Many still have a few little shoots so they will survive long enough to flower and set a few fruits before winter but since potatoes don't tuberise well in heat I don't think I will be able to select them on production. I will just plant them all out next year and then do my selecting. That means not having enough space to plant a lot of TPS next year but the selection of this lot will be fun as second year plants tend to be bigger and produce better. As I have said in earlier posts, I have been very happy with a few of the early tuberisers and planted them out when they were dug. Some are sprouting so I will be able to see how they produce in a couple of months, before the frosts hit. Since the eggplants have been so late to set fruit, and the fruit is hidden under the leaves the cockies didn't damage them so I should get a good harvest. This is the first variety to set, it is 'Antigua'. I have a few plants bearing fruit and will net them all tomorrow. 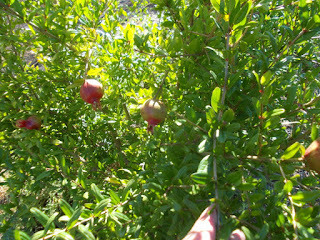 These fruits look amazing even though the plants didn't recover well from the cold start to the season and are still tiny. Next year I will plant them later. I have four varieties in this year. 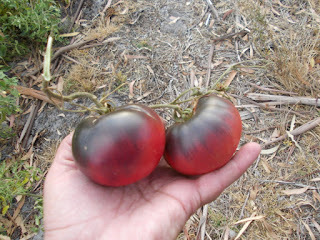 I planted more tomato varieties this year than I normally do and although cockies and heat have decimated them I have managed to get enough fruit to harvest some seed from. 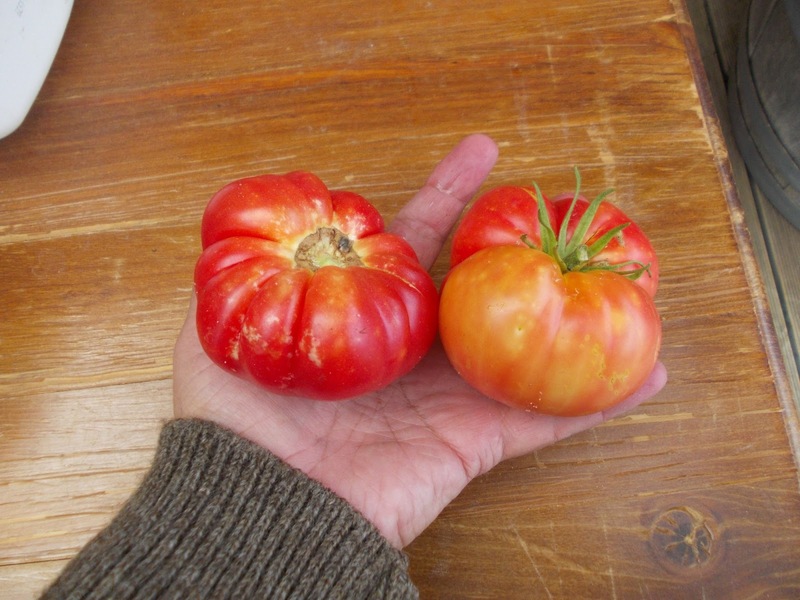 This one is a large orange/red, beefsteak variety called 'Northern Lights' which I am pretty impressed with even though it is very sensitive to heat. 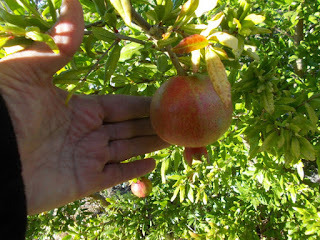 The fruits get to double the size pictured here, and they are really tasty. Another new one for me is 'Indigo Blue Beauty' which is very eye catching with its broad purple shoulders, and it does a lot better in the heat. I will definitely be growing it again. In fact there is only one variety I am growing this that I won't bother growing again due to plainness and low production - 'Santa Clara'. I sent my last wholesale lot of seed off to a seed company today. I will still be selling any larger lots to seed companies if I have enough but I will not be concentrating on that now. The seed I grow now will be just for my online shop: www.gardenlarder.net I feel relief already, though I will have to work hard to get more customers. Not much happening at the moment as the temps are sitting between 35 and 45 degrees for the next week at least, so I can only do any work early in the morning. 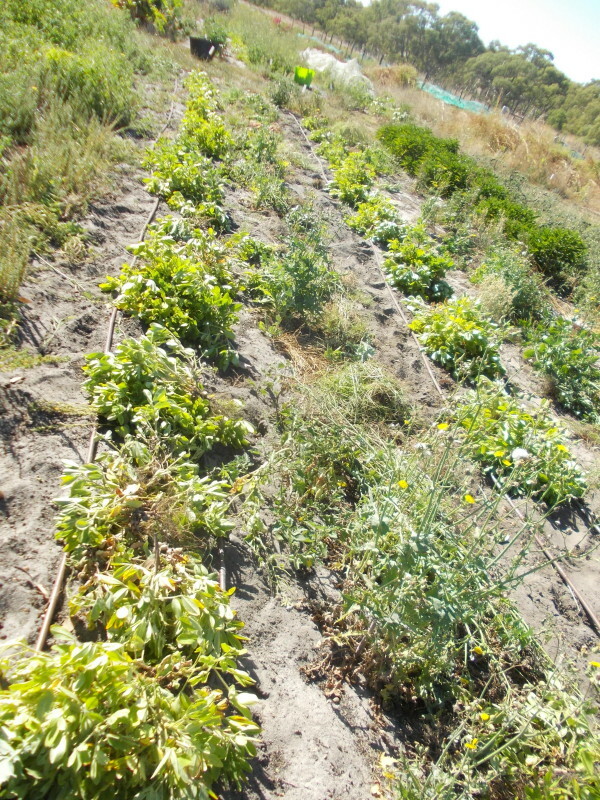 The forced down time has allowed me to think of what else I can do if I am not going to grow vegetables. The trademark on my business name Garden Larder also allows me to market plants as well as the fresh veg and seeds so I will be concentrating on plants that don't attract so many pests. 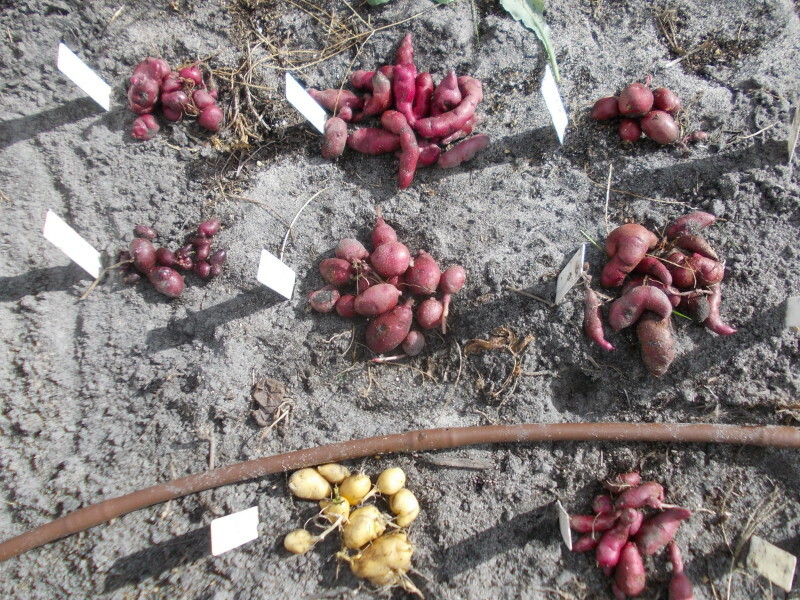 I will be spending more time and effort on my potato breeding projects. I have the space for them and some really nice new varieties to offer in the next couple of years. I have even been contacted by someone who has tentatively suggested a collaborative effort with the program, and he has breeding industry experience with the big guys. I made a quick, little video on a potato reveal this morning if you would like to look at it on Youtube. My filming skills will have to improve and I will have to buy a tripod before I do too much more of this kind of thing. Other than the potatoes I will plant more bulbous and tuberous flowers to sell as bulbs. I don't know if there is really a market for them online but I might be able to sell them at markets. I can't compete with the big bulb nurseries. 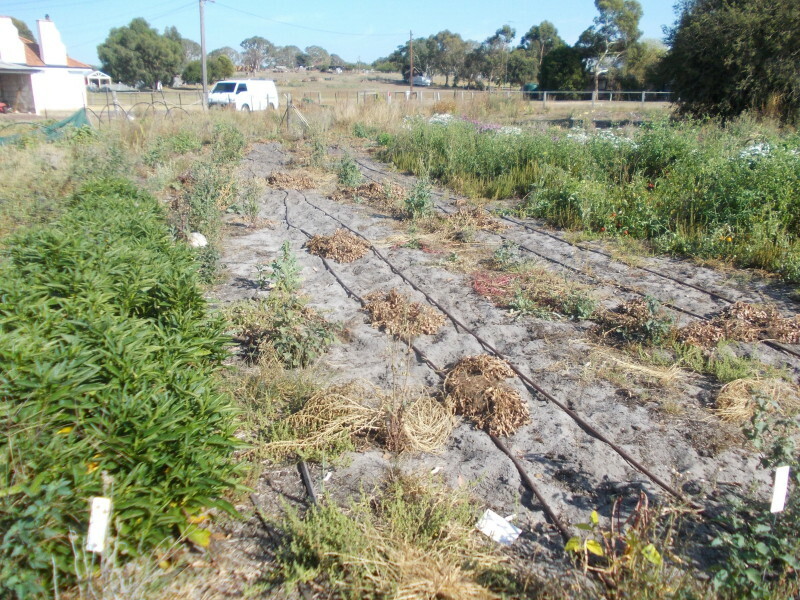 I have looked a little into growing herbs but I don't think that is for me, not only with the amount of work involved, and trying to find markets, but I just can't afford the infrastructure that would be needed.